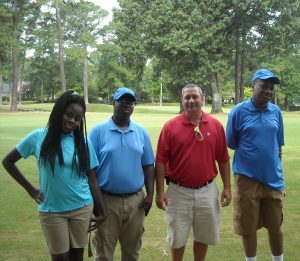 Bria Harris, 21, Terrill Jones, 24, Gerald Stallings, 22, and Lamonte Williams, 35, are employed year-round as part of the club’s maintenance team and are enjoying their roles that contribute to the course’s stellar reputation. Harris, Jones, Stallings and Williams participate in Monarch’s Health Drive Day Program. Health Drive Community Team Leader April Judson explains that William’s employment principles displayed while on the job were a glowing testament for his fellow day program attendees when the club wanted to add to its maintenance team. “Lamonte possesses such good employment standing and a strong work ethic. They were interested in reaching out to us for additional staff,” explains Judson. When Harris, Jones and Stallings were initially approached about the job opportunity, the three expressed they were eager to work, as well as receive a paycheck. However, they also took the application process seriously. “They really wanted a job making money, so we worked with them to fill out the application, practice for the interview process and read company policies,” Judson says. Prior to becoming employed, Judson says the crew gained valuable training through their volunteer roles. “Each of them benefitted from experience volunteering for community groups. This helped greatly in becoming gainfully employed,” Judson explains. Even though they are employed, each continues their volunteer responsibilities. Holt explains that the Health Drive crew is tackling tasks crucial to the efficiency of the course. “These are detail tasks that if not done, golfers take notice. They always do a great job and the highly visible work they do is extremely important,” Holt says. “I enjoy picking up the pine cones,” states Harris, who gives her job two thumbs-up. Jones says picking up branches and limbs is his favorite part of being on the maintenance team. Williams and Stallings are fond of riding in the golf cart to get around the course. “They take pride in their work and are an integral part of the maintenance team. They have really embraced their jobs and know what to do to be successful,” Holt explains. With their earnings, Jones and Stallings bought their favorite foods, while Harris purchased shoes because she loves fashion. Williams shopped for a new pair of black shoes. “Not only does being employed teach them skills and independence, but the positive aspects of earning their own income,” adds Judson. The Health Drive crew is treated like a valuable part of the maintenance team and included in staff functions such as appreciation lunches or special tournaments. “We have a really good work environment. They each mesh so well with all the personalities of the club team,” notes Holt. Pictured from l to r: Bria Harris, Terrill Jones, New Bern Golf and Country Club Maintenance Supervisor Todd Holt and Gerald Stallings enjoy their new job at the New Bern Golf and Country Club.